The first large-scale project Gaudí carried out for his great patron, Eusebi Güell, was the construction of the pavilions of the Güell Estate at Avinguda Pedralbes, number 15, between 1883 and 1887. The commission consisted in the design of the gardens of the summer residence – today’s Royal Palace – and in the building of the entrance gates all around the property and the two entrance pavilions which formed the gatekeeper’s lodge and the horse stables. 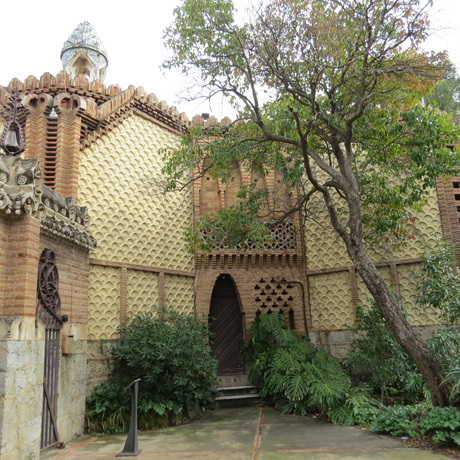 Count Güell had inherited the lands of Can Feliu and Can Cuyàs, in what was then the municipality of Les Corts de Sarrià, and wanted to enhance the presence of the main structure built there by the architect Joan Martorell. Gaudí left his personal mark with the Neo-Mudejar aesthetic characteristic of his early works, and with the introduction of parabolic arches and vaults and hyperbolic domes. 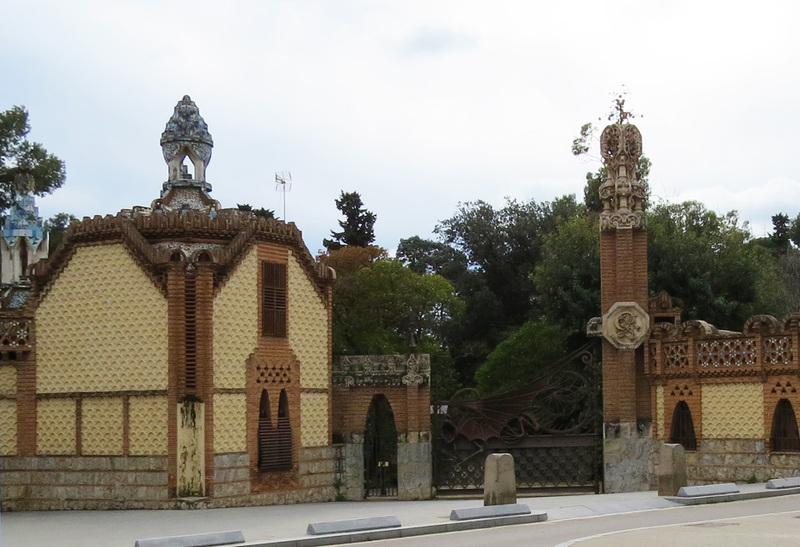 The Güell Estate had several entrance gates, one for each cardinal direction. Gaudí worked in particular on the access of the northern area where the road leading to the city was located. This was the main entrance through which guests arrived, and it was very close to the manor house that had been reformed and enlarged over the years, becoming in effect a small palace. The artist also did some minor ornamentation works on its exterior. 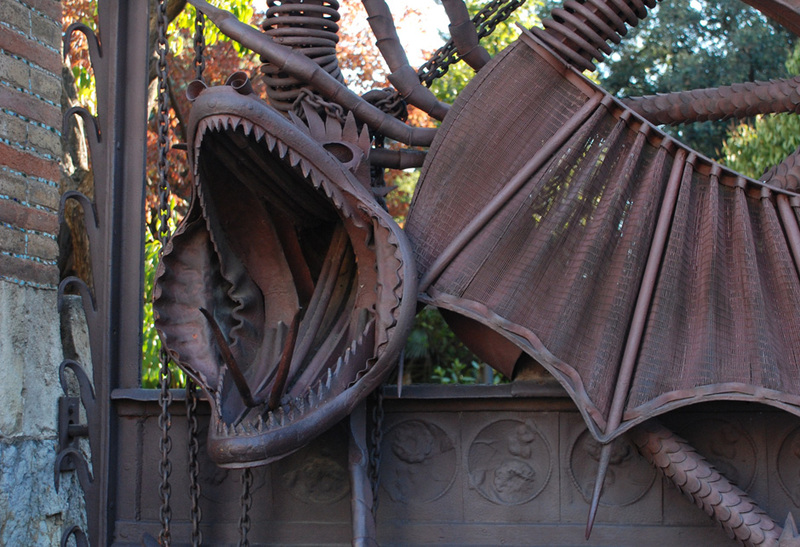 The most notable and striking element here is the spectacular wrought iron grille of the carriage entrance in the shape of a dragon with glass eyes. This figure represents Ladon, the guardian dragon of the Garden of the Hesperides, which was overcome by Hercules, as told by Jacint Verdaguer in an episode of his poem L’Atlàntida. The shape of the dragon corresponds to the positions of the stars in the constellation Serpens, into which Ladon was transformed as punishment for having stolen some oranges. Just above the dragon there is an orange tree made of antimony, also in allusion to the Hesperides. The other three gates of the estate lost their utility with the construction of Avinguda Diagonal. One stands outside the cemetery of Les Corts, although its iron grille was moved to the Gaudí House-Museum in Park Güell. The second one was rebuilt in 1957 next to the Faculty of Pharmacy, and the third one was restored in 1982 and installed close to the Institute of Earth Sciences Jaume Almera, on the Pedralbes campus. In front of the park, within the perimeter of the old estate, the two pavilions, joined by a small pedestrian entrance and a large (5 metres wide) majestic entrance for carriages, have been preserved. The original brick wall, with secondary openings, still exists as well, advancing along Avinguda Pedralbes and Carrer George Collins. Gaudí would repeat this twofold architectural arrangement later on with some functional and stylistic variants at the main entrance of Park Güell. The first pavilion, known as the gatekeeper’s lodge, is a small building of imposing volumes. 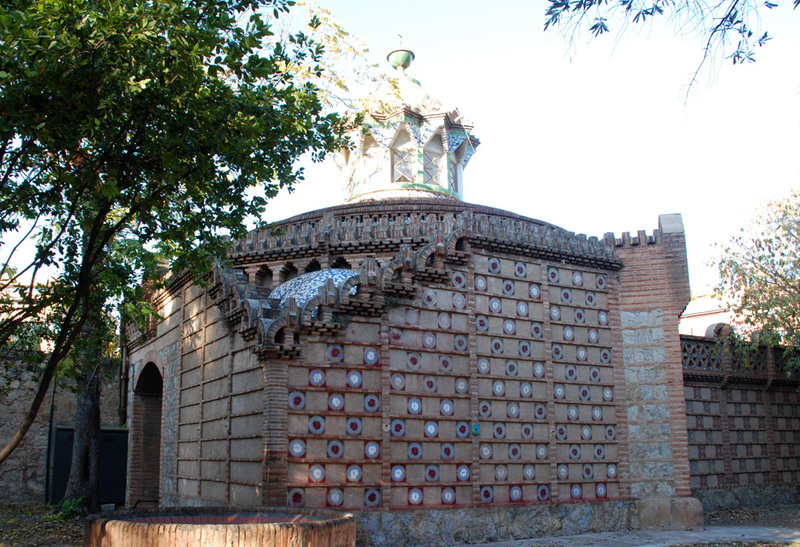 Formed by two bodies topped with attractive domes, it is designed in a rather eclectic style that contrasts notably with the pavilion of the horse stables. The architect’s mixture of structural and surface ornamental elements is quite interesting. Gaudí used raw mud (a low cost material with a good thermal capacity) to build the retaining wall. On the other hand, he used solid bricks in colours ranging from red to yellow for the corners and the areas of the walls most exposed to load stresses. The horse stables, for their part, also have a dual composition formed by the main body, where the stables are located, and another body with a circular plan, topped by a spherical vault that covers the space known as the longeing ring. The shape of this building reflects its purpose and the construction technique used. 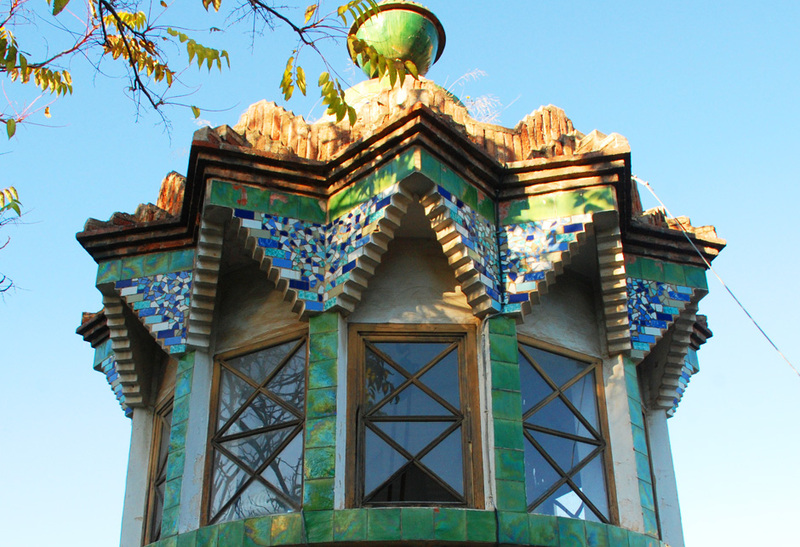 This youthful work delighted his client and it is an example of the best Gaudí. The structure is based on a set of parabolic brick arches and thin-tile Catalan vaults with a slightly curved profile, forming the space for the horses and their troughs, the latter catching the rain water collected on the roof. 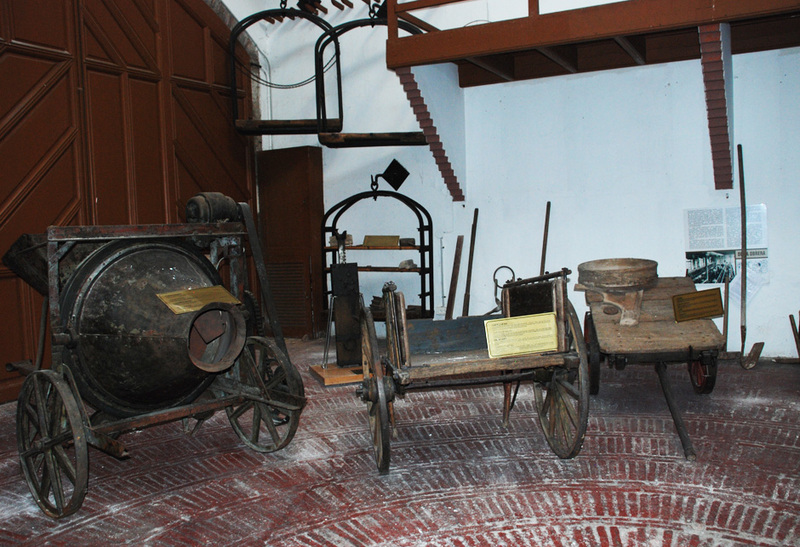 The walls are made of mud covered with ceramic and cement pieces, and they are strengthened with rows of solid bricks. 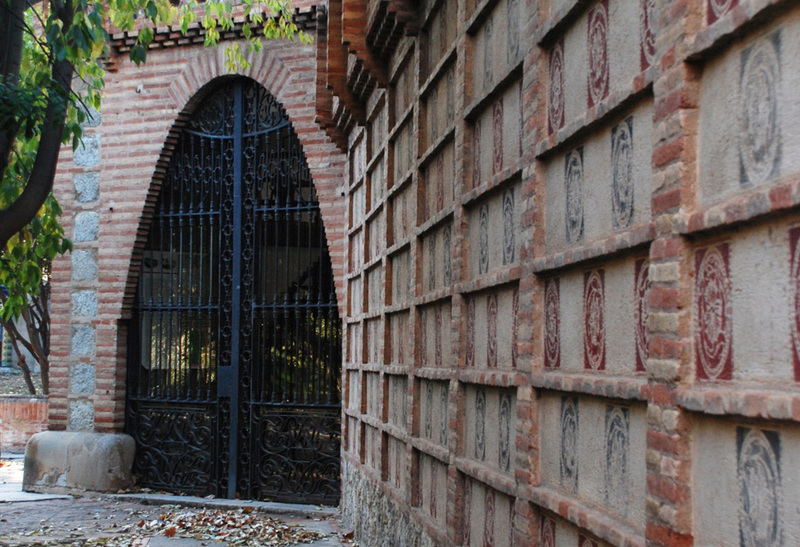 These bricks were essential structural materials which the architect put to advantage to decorate the exterior of the building with some incipient trencadís mosaics, just as he had done at the Vicens House, his first project in Barcelona. After Eusebi Güell’s death, his heirs assigned part of the estate located above the new Avinguda Diagonal to the State so that it could be used as a royal residence. The mansion was completely reformed and the architect Nicolau Maria Rubió i Tudurí designed and supervised the building of some magnificent gardens which are now public and in which one may still find samples of minor works by Gaudí. In 1958 a large part of the land close to the Royal Palace was purchased in order to build the new University Campus. Once in the possession of the University of Barcelona, the pavilions were re-adapted and in 1969 they were declared to be a Monument of National Historic and Artistic Interest. 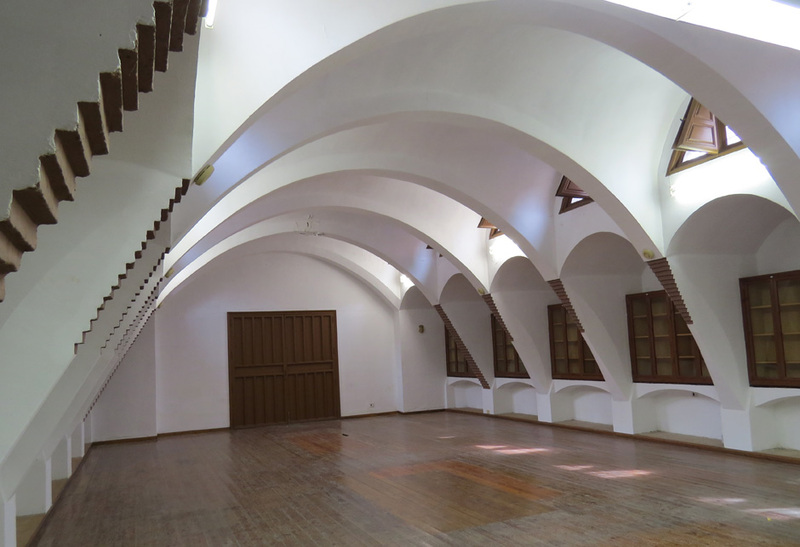 Whilst the former gatekeeper’s lodge was conditioned to house university staff, the horse stables were used from 1977 as the headquarters of the Gaudí Chair in accordance with an oral assignment made by the rector to Professor Joan Bassegoda, who most certainly saved the damaged building with the restoration works he commissioned. At present the University of Barcelona continues to manage both buildings, which are vacant and awaiting restoration.